where you will have to drink a 2 ft and 3 inch glass of Milk Boba Tea in 30 minutes! Contestants have 30 minutes to finish a 2ft 3in glass of boba milk tea. No bathroom breaks are allowed. Contestants are allowed to drink water to help wash it down. If contestants finish within the allotted time, they win a $225 JT Boba House gift card and will have their photo posted on the website and the Hall of Fame wall in the store. 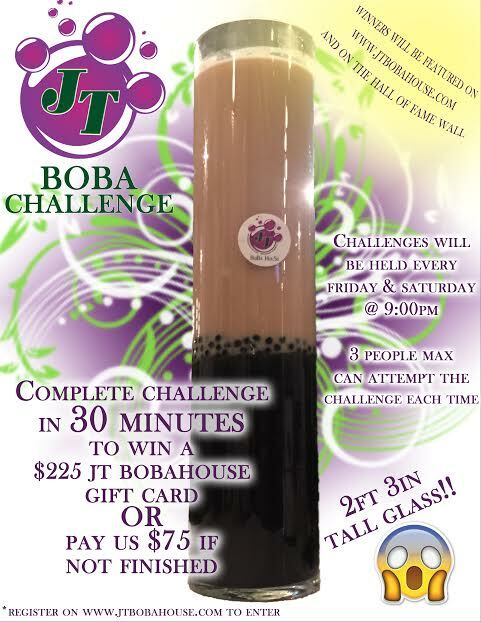 By registering for this challenge, you are liable for yourself and JT Boba House is not responsible for any medical condition. By selecting a day and time, you are confirming that you will be at the Challenge the week of your registration. Please call in ahead of time, if you are unable to make it.